No wonder Tim Cook is smiling. 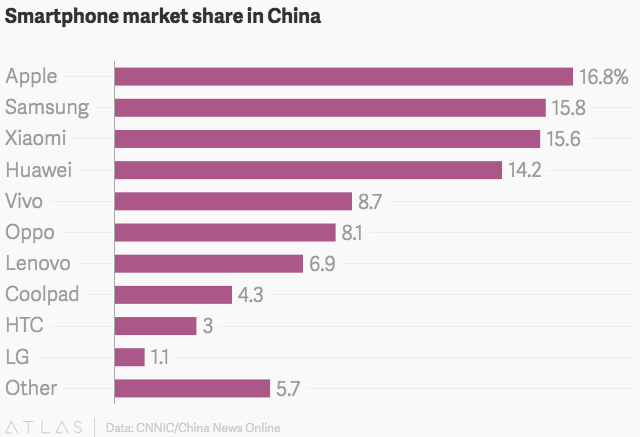 The iPhone is big in China. How big? Until now, it was a mystery because Apple has never disclosed how many of the devices it has sold in the Middle Kingdom. Luckily, the Chinese government has crunched some numbers that shed light on the Cupertino company’s popularity. A report (link in Chinese) from the China Internet Network Information Center, a branch of the Ministry of Industry and Information Technology that oversees internet policy, states there were 780 million activated smartphones in China in 2015, a penetration rate of about 59% of the population. Apple iPhones accounted for approximately 16.8% of those smartphones, the report says. That means there are about 131 million iPhone owners in China, assuming every iPhone owner keeps only one activated device—more than any other country in the world. (The US, the world’s second-largest market, is estimated to have about 100 million iPhone users). Apple famously does not reveal its shipments or final sales numbers for its devices by region. Instead, it only releases global sales of each device, and revenues by region. This has made it difficult for analysts to gauge just how popular the phone really is in China. While Apple might be the most popular smartphone brand in China, and China may be its largest iPhone market, its glory days there may be over. Its strong appeal as a status symbol means the iPhone will continue to be popular. But a lag in overall smartphone sales in China, along with mounting political pressures, could make its next five years in China more difficult than the last.